A1 Security are BAFE SP203-1 accredited in Design, Installation, Commissioning, Handover and Maintenance. Evidence of our third-party certification can be viewed here. Regular servicing and maintenance of your fire alarm system is a legal requirement. It will also give you assurance that your fire alarm equipment will work when it is needed most. Landlords, occupiers, owners or employers are responsible for maintaining fire safety, including fire alarm systems, at their premises. In addition, you need to test your fire alarm on a weekly basis to ensure you comply with the requirements of BS5839. 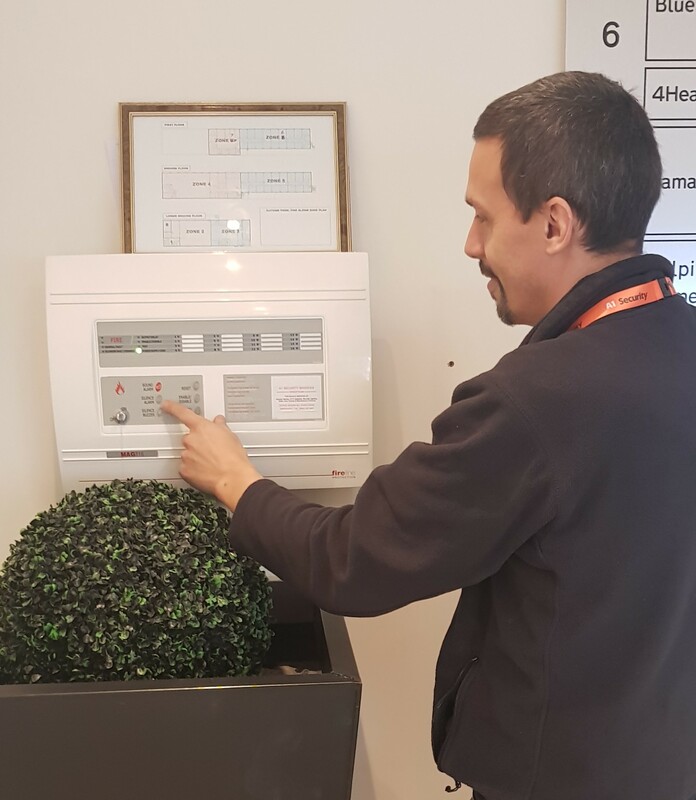 Our fully trained and competent engineers can carry out fire alarm servicing to any fire alarm system, in any type or size of premises. All servicing is carried out in accordance with BS5839-1. What is tested on a fire alarm service? We can service your system annually, six monthly or quarterly. Your fire risk assessment will indicate how regularly your system is to be serviced. The risk assessment considers the type of fire alarm system installed, the environment in which it operates and other factors that may affect the long-term operation of the system. Our recommendation is that inspection and servicing visits should be carried out every six months. In addition, you need to test your fire alarm on a weekly basis to ensure you comply with the requirements of BS583. •	A fully functional fire alarm system will give you an early warning signal in the event of fire, enabling safe and timely evacuation. •	Regular maintenance of your fire alarm system can also benefit you by maximising component life and minimising false alarms. •	You are less likely to encounter problems with claims on your insurance. •	You also avoid trouble by complying with Health and Safety rules. All maintenance contracts offer access to our 24-hour emergency call-out facility. This gives you the peace of mind that in the event of any emergency an engineer’s is on hand to help.